Already considered one of the most difficult airports in the world, today April 14, 2019, at the Lukla Tenzing-Hillary Airport in Nepal an aircraft designed for high-altitude, short runway take-offs and landings veered to the right while taking off, crashing into a parked helicopter killing the first officer of the airplane and one police officer standing near the helicopter. A second police officer who was injured, later died while undergoing surgery in Kathmandu. Four other people were injured but are reported out of danger. Summit Air, originally branded as Goma Air, was founded in 2011. In 2014, the airline acquired this new Let 410 UVP-E20 aircraft. It was the first aircraft of this type to be operated in Nepal. Due to the difficulty of landing and taking off at the airport, the Civil Aviation Authority of Nepal only allows experienced pilots who have completed at least 100 short-takeoff-and-landing (STOL) flights, have over one year of STOL experience in Nepal plus completed ten sorties into Lukla with a certified instructor pilot to fly in and out of Lukla. According to Summit Air’s Facebook page the incident occurred at 9:01 am local time Sunday morning. There were no passengers on board, only the two pilots and one flight attendant. The dead were identified as First Officer Sujit Dhungana, Mr. Ram Bdr. Khadka and Mr. Rudra Bdr Shrestha (Asst. Sub. Inspector) who were on duty at the helipad. The plane hit a Manang Air AS 350 B3e helicopter that had just landed and two passengers has disembarked moments earlier. The rotors were still moving when the collision occurred. The pilot, Chet Bdr. Gurung, was on board and not seriously injured. A second helicopter operated by Shree Airl was slightly damaged. A small fire broke out as a result of the collision. The exact details of what caused the plane to veer off the runway is unclear. Video shows that it began to veer almost immediately as it started its roll down the runway. It then veered off 30 to 50 meters between 100 and 175 feet down the 460-meter/1,500-foot runway. This same airplane had problems with it’s landing gear steering on April 16 2018 also at Lukla. Lukla bound flights have become infamous for crashes with seven since 2000 killing over 50 passengers and crew. The runway sits at the top of a 2,000 foot cliff and ends where a high mountain wall begins. There is no opportunity for a missed landing or equipment failure. The most fatal incident occurred in October 2008 when a Yeti Airline’s Twin Otter crashed in poor weather on final approach. The plane caught fire killing eighteen passengers and crew. Nepal is well known for having a poor avaition safety record. In February 27, 2019, an Air Dynasty helicopter carrying Tourism Minister Rabindra Adhikari and six other people crashed killing all onboard while flying in a snowstorm in far western Nepal. 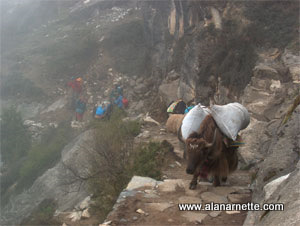 Lukla is the gateway to Nepal’s Khumbu area and Mt. Everest. Every year, over 100,000 people fly into the airport for tourism including trekking and mountain climbing. Also the airport serves as a gateway for commerce. Most teams take a fixed winged airplane from Kathmandu to Lukla, but the flights are notorious for being canceled at the last minute. Lukla sits at 9,400 feet and often is shrouded by low clouds or rain. Helicopters have increased in popularity in recent years as they are more versatile managing the dangerous runway. The runway at the Tenzing-Hillary Airport was built in 1964 and was a simple grass strip until being paved in 2001. The runway is short, only 1,510 long and 66 feet wide (460 by 20 m) at a 12% slope. A fleet of STOL Twin Otters, and Dorniers fly daily from Kathmandu for about USD$140 one way by Yeti Airlines, Sita Air and several other airlines. This video of today’s incident was posted on YouTube by Watchtower. A second video is also on YouTube of today’s crash. The airport has reopened for normal operations. I took this video in 2008.